February was an exciting month in Spanish Kindergarten we had the chance to celebrate 100th day, Día de Amistad y Amor and We Love to Read Month. 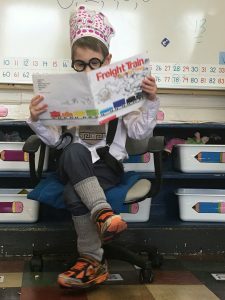 The highlight of the month was that we had the chance to hear from one of our very own readers from room 14, our student Noah it was a great time that we spent together listening to him share his story. Thank you! Gym Shorts	Room 13: Learning All About Colours!